By mimicking how dogs get their whiffs, government and university researchers have demonstrated that “active sniffing” can improve by more than 10 times the performance of current technologies that rely on continuous suction to detect trace amounts of explosives and other contraband. Researchers have looked to one of nature’s best chemical detectors – the dog – to help make today’s chemical detection devices better at sniffing out explosives and other contraband materials. 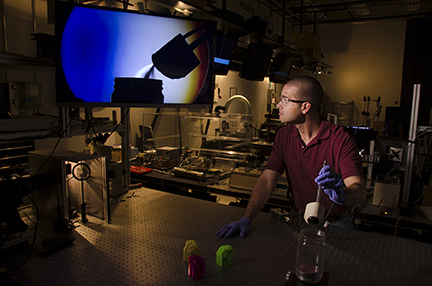 Matt Staymates, a mechanical engineer at the National Institute of Standards and Technology (NIST), uses a schlieren imaging system to visualize the flow of vapors into an explosives detection device fitted with an artificial dog nose that mimics the “active sniffing” of a dog. The artificial dog nose, which was developed by Staymates and colleagues at NIST, the Massachusetts Institute of Technology Lincoln Laboratory, and the U.S. Food and Drug Administration, can improve trace chemical detection as much as 16-fold. Laser light sheet flow visualization of the dog’s nose sampling low-lying theatrical fog. The viewpoint in this video is looking over the right shoulder of the dog as it sniffs fog on a horizontal surface. The artificial dog’s nose switches between active sniffing and constant inhalation to demonstrate the differences in the surrounding fluid dynamics as the dog sniffs. During active sniffing, flow is pulled from tens of centimeters in front of the nose, while during inhalation the aerodynamic reach of the nostrils is dramatically reduced. Schlieren footage of the biomimetic dog’s nose sniffing an acetone-soaked foam plug within a training aid can. The frequency of sniffing is 5 Hz and the sinusoidal flow profile is similar to that of a female Labrador retriever.